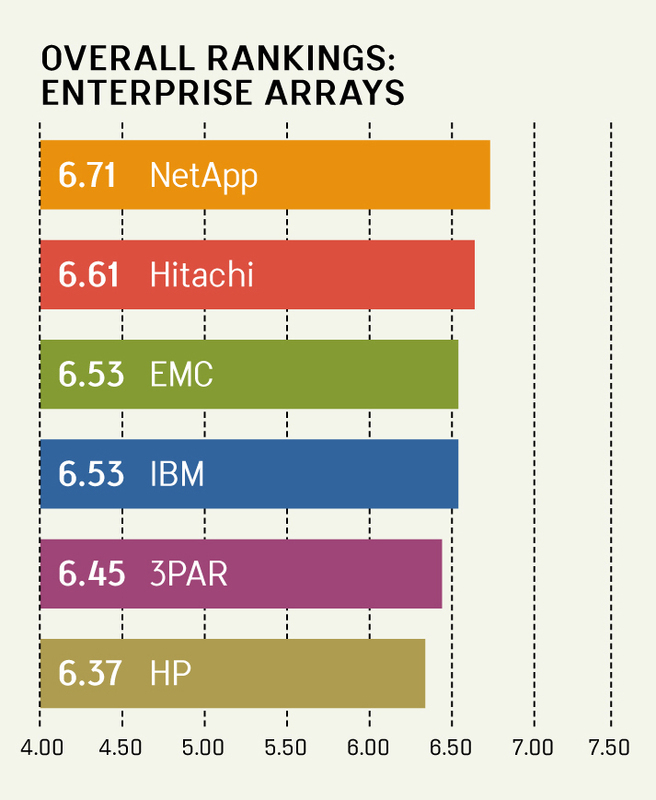 A very strong group of enterprise array vendors racked up some of the highest scores we've seen to date on the sixth edition of the Quality Awards for enterprise arrays. These products were included in the sixth Quality Awards for enterprise arrays survey (number of responses in parentheses). Every competition has its winners and losers, and the latest Storage magazine/SearchStorage.com Quality Awards for enterprise arrays is no exception. NetApp Inc. is the clear winner in a very competitive field, but it doesn't seem appropriate to call the other five vendors losers as scores across the board were impressively high -- only 0.34 points separated NetApp's high overall rating and the lowest score. This is the second consecutive time NetApp has finished first, after sharing top honors with EMC Corp. on the fourth edition of the Quality Awards. Such a solid showing from NetApp should convince any remaining skeptics that NetApp isn't just network-attached storage (NAS) anymore. NetApp cruised into the lead with an overall 6.71 by taking top honors in four of the five rating categories, including a couple of narrow victories for sales-force competence and initial product quality. Hitachi Data Systems finished a strong second with a score of 6.61, while EMC and IBM were deadlocked in third with a score of 6.53. Users' ratings were overwhelmingly positive. For the first time, all vendors and their product lines racked up scores of 6.00-plus in every category. Average category scores were also the highest we've seen in six iterations of the enterprise array survey, and the overall average rating was the highest to date. Clearly, enterprise storage system vendors are doing a good job of meeting the needs of their users. Enlarge OVERALL RANKINGS: ENTERPRISE ARRAYS diagram. 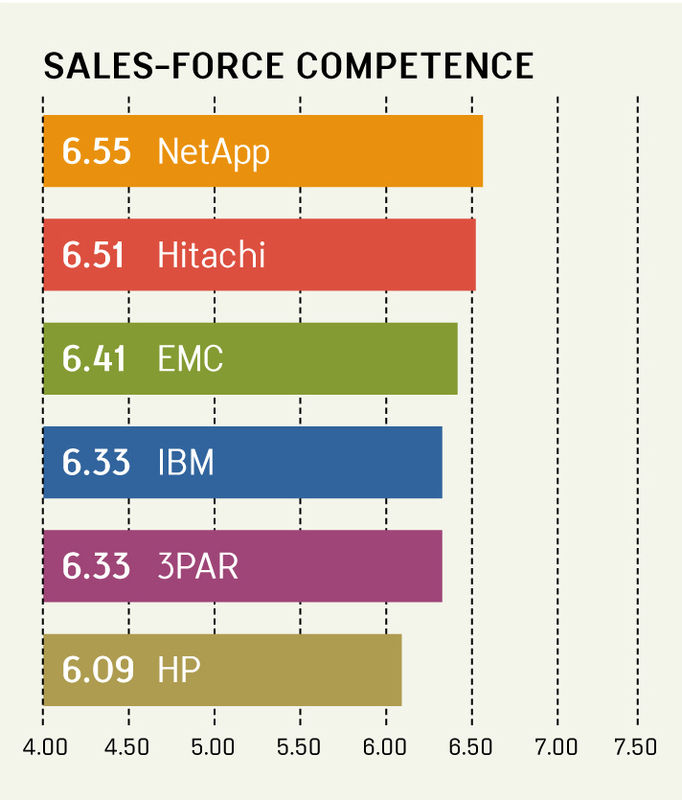 NetApp just barely nudged out Hitachi in the sales-force competence rating category. The six statements in the category all relate to how well a vendor's sales and sales support teams respond to the needs of their prospective customers. NetApp finished first for two statements: "My sales rep is knowledgeable about my industry" (6.66) and "My sales rep understands my business" (6.56). Hitachi ranked highest for "My sales rep is flexible" (6.61) and "My sales rep is easy to negotiate with" (6.45). 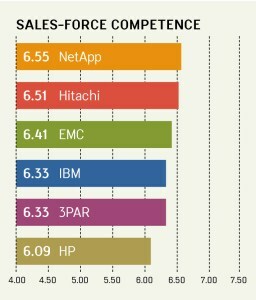 EMC's 6.78 led a bevy of strong scores for the statement "The vendor's sales support team is knowledgeable." Praise was spread around fairly liberally in the sales-force competence category, with four vendors leading on at least one statement. Overall, the average for all six products is the highest sales satisfaction rating registered to date on the enterprise array Quality Awards. A sales team may pave the way for its company's products, but the true test doesn't happen until the system is uncrated, racked and declared ready to run. NetApp prevailed again in this category but by such slim a margin (0.01 point) over 3PAR that it would be more accurate to call it a statistical dead heat. 3PAR flirted with the 7.00 mark with a score of 6.97 for "This product was easy to get up and running," which helps to validate its claim as being among the easiest-to-use arrays. Enlarge INITIAL PRODUCT QUALITY diagram. Hitachi's 6.78 and 3PAR's 6.77 led for the statement "I am satisfied with the level of professional services this product requires," and NetApp ranked highest for three statements relating to defect-free installations, little need for vendor intervention and ease of use. Hitachi garnered the crown for the key statement "This product delivers good value for the money" with a 6.73; NetApp was second for the statement with a 6.62. Scores were high in the initial product quality rating category, and winning margins were barely measurable. With strength across the board, it appears enterprise data storage vendors are making good first impressions by getting their products up and running as quickly and painlessly as possible. Even when a good sales experience is reinforced by solid initial operations, the acid test for an enterprise storage system ultimately comes down to whether or not it does all the things you need it to do. 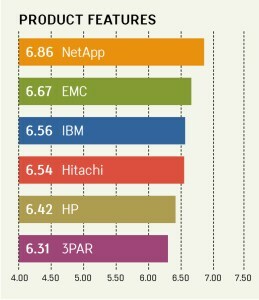 Once again, all products fared extremely well in the product features category, with NetApp leading the pack with a 6.86 score, highlighted by one of only two 7.00-plus scores -- a 7.11 for "This product's snapshot features meet my needs." 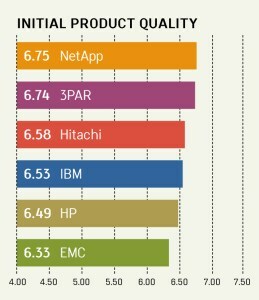 That's probably not a huge surprise as NetApp is known for its snapshot prowess and has done well in that area on previous Quality Awards. NetApp nearly swept the product features category, getting scores close to 7.00 for two other statements: "This product's mirroring features meet my needs" (6.96) and "Overall, this product's features meet my needs" (6.91). For the lone statement NetApp lost out on, EMC flexed its scalability muscles but fell just shy of the 7.00 mark with a still-striking 6.98 for "This product's capacity scales to meet my needs." With many enterprise array purchases carrying six- or seven-digit price tags, the tipping point for an investment of that size is likely to pivot on how reliably the product performs over a period of time. Here, too, enterprise storage vendors can pat themselves on the back a little, as the product reliability category netted the highest average score among the five rating categories. Four of the six products in the current survey turned in their best scores in this category, with Hitachi beating all comers with a very solid 6.85 rating. 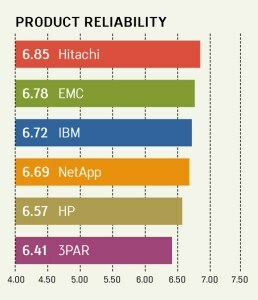 EMC (6.78) and IBM (6.72) had their best category results for product reliability and finished second and third, respectively. Hewlett-Packard (HP) Co. also netted its best point total, finishing with a 6.57 that placed it fifth in this strong field. Hitachi earned high scores for four of the five statements in this category and missed snagging the fifth by a mere 0.03 points. The true test of reliability is uninterrupted service, and all products in this survey were rated at 6.50 or better for the critical statement "This product experiences very little down time." 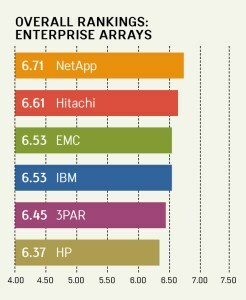 Hitachi and EMC share the top spot for that statement, both within a hairsbreadth of 7.00 with identical 6.97 scores. Meeting expectations is also a key gauge of reliability. 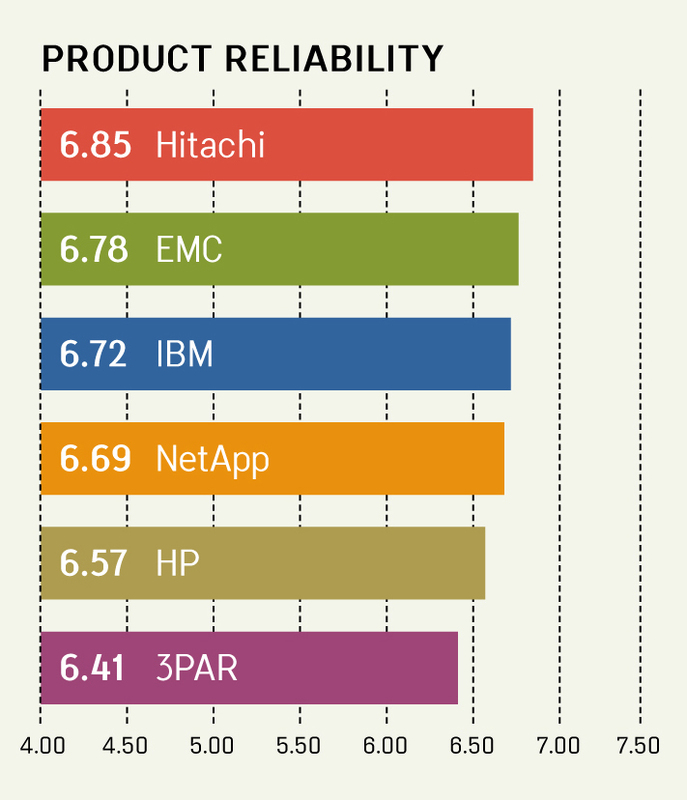 Again, all six products came through with scores of 6.50 or higher for "The product meets my service-level requirement," highlighted by Hitachi's 6.98 and EMC's nearly as dazzling 6.96. Stuff happens. And sometimes that stuff happens to a very large, very expensive storage array. No storage manager wants to be the one who has to pick up the phone and make "the call," but when it's unavoidable, a quick and effective reply is the best way a vendor can soothe jagged nerves. When it comes to delivering support as promised, our vendors fared well, with all six netting their highest scores in the technical support category for "Vendor supplies support as contractually specified." 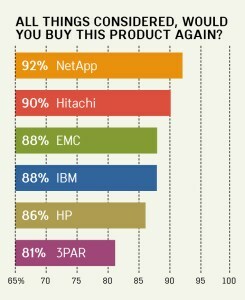 Hitachi's 7.00 nosed out NetApp (6.97) for that statement and racked up only the third 7.00 statement score in the survey along the way. There truly weren't any weak performances when it comes to meeting users' expectations -- HP's 6.26 might have trailed the pack, but it's a sturdy score nonetheless. The Storage magazine/SearchStorage.com Quality Awards are designed to identify and recognize products that have proven their quality and reliability in actual use. The results are derived from a survey of qualified readers who assess products in five main categories: sales-force competence, initial product quality, product features, product reliability and technical support. Our methodology incorporates statistically valid polling that eliminates market share as a factor. Our objective is to identify the most reliable products on the market regardless of vendor name, reputation or size. Products were rated on a scale of 1.00 to 8.00, where 8.00 is the best score. A total of 441 respondents provided 727 system evaluations. 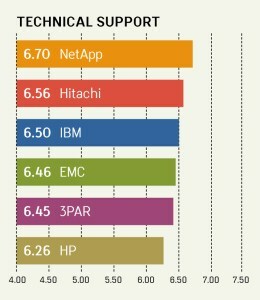 Ultimately, NetApp prevailed in the technical support category by topping the ratings on five of the eight statements; second-place Hitachi ranked highest on the other three. 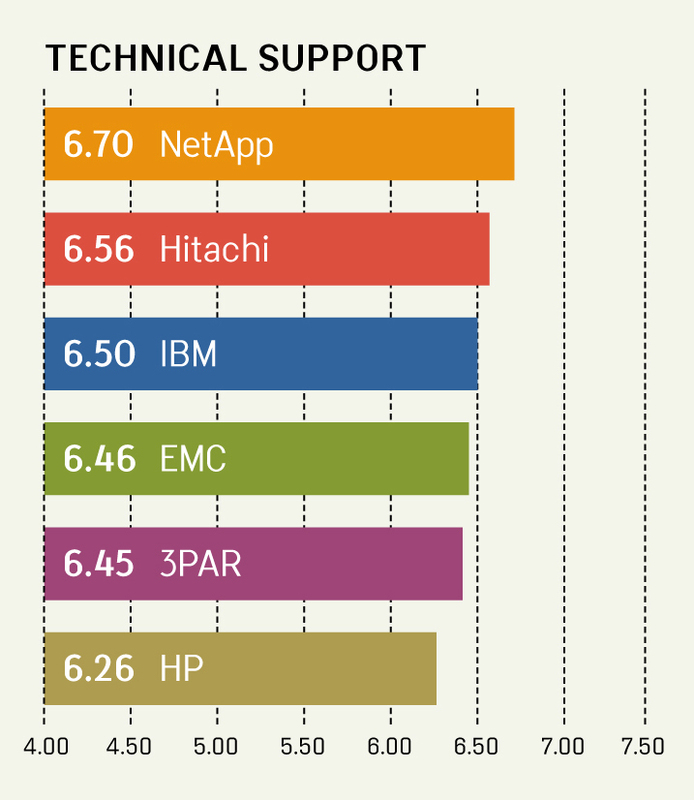 In the six enterprise arrays surveys we've fielded, NetApp's 6.70 and Hitachi's 6.56 technical support category scores are the highest recorded to date. The strongest indicator of product satisfaction might be a customer's willingness to make the same purchase all over again. When we asked that question on this survey, the results mapped very closely with the overall rankings for service and reliability. 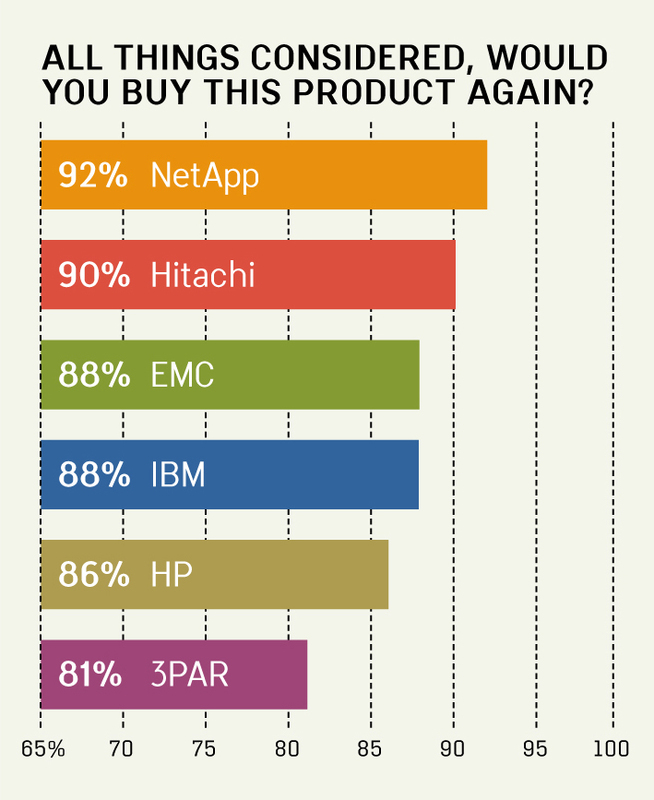 That's great news for vendors like NetApp and Hitachi, whose prospects of repeat customers look very promising with buy-again numbers north of 90%. But the overall picture has to be pretty pleasing to data storage vendors and users alike as 87% of all users in our survey said that with the benefit of hindsight, they'd still buy the same storage systems again. Enlarge WOULD YOU BUY AGAIN? diagram.